Concerts have been held in memory of teenagers killed by a drunk driver who had been at a Christmas party. Alex Ross and Sian Chambers died when Matthew Jacobs, who had been drinking for six hours with work colleagues, crashed into their parked car. The 19-year-olds were asleep in the back of the car on a lay-by when Jacobs crashed into them in the early hours of 22 December. 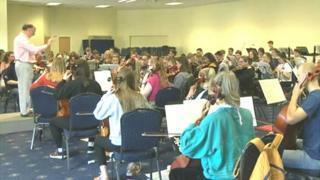 Lincolnshire Youth Orchestra performed the concerts on Friday and Saturday. Mr Ross was in his second year at the Royal Academy of Music in London, while Ms Chambers was a talented double bassist, taking a gap year before starting an Animal Science degree. Both had played with local and national orchestras. Their friends from Lincolnshire Youth Orchestra put on the concerts on Friday and Saturday night. Jacobs, 26, was jailed at Lincoln Crown Court for seven years in March after admitting two charges of causing death by dangerous driving for the deaths of Mr Ross and Ms Chambers.